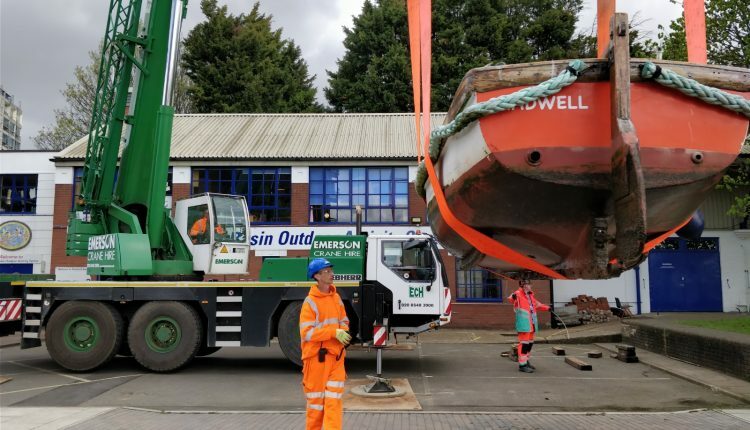 Rope and Sling Specialists Ltd. (RSS) donated lifting and rigging gear to the Shadwell Basin Outdoor Activity Centre in East London as the charity had a requirement to lift a 2.5t rescue support boat out of the River Thames onto land for maintenance and repair. The activity centre is located next to the King Edward Memorial Park Foreshore (Wapping) site of the Thames Tideway Tunnel project, a major new sewer. RSS is a frequent visitor to the area, providing lifting equipment and periodic Lifting Operations and Lifting Equipment Regulations (LOLER) inspections for the site, made up of the foreshore of the tidal Thames River next to King Edward Memorial Park and an area to the south. The activity centre provides watersports and adventurous activities, including training courses, events, and sessions for groups, schools, and individuals throughout the year. It approached Tideway officials to ask for their help to lift a boat out of the water and back again once repairs were completed. To experienced lifting professionals the project was routine, but the charity wouldn’t have been able to execute it alone. RSS supplied two MOD 6 spreader beams at 2.5m and two 10t capacity, 12m-long duplex webbing boat slings. The boat was 7m long and 2.5m wide; a canoeist and slinger combined to pass the slings underneath the vessel whilst in the water before a three-axle Liebherr mobile crane, kindly donated by Emerson Crane Hire, already rigged with the top slings, raised it from the water.